Glamorous night shots as seen in not-quite-real-looking postcards from the 1930s and ’40s are among my favorites. 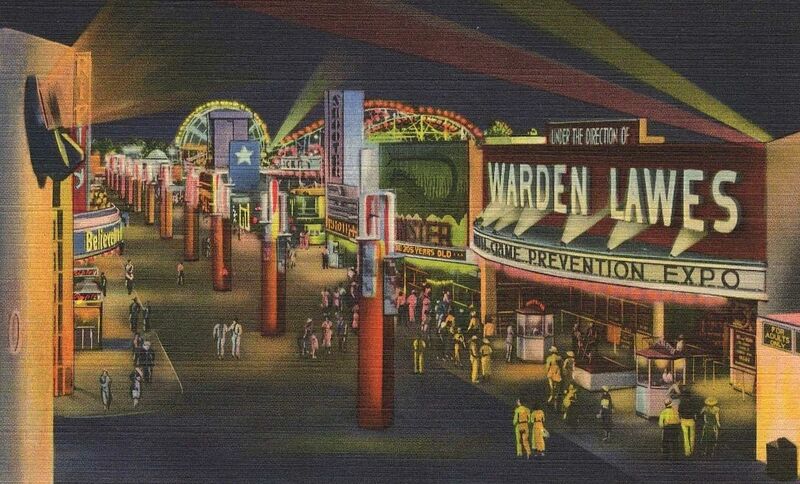 And this shot, of the Texas Centennial Exposition Midway at night-time is so, so GREAT! Night life in all its glory and glamour. Oddities, Animal Shows and Girl Shows to charm the most fastidious, along the Midway. Compare to the shots of this stretch of the Midway from the other direction, in my previous post here. Click picture for MUCH larger image! Where are those light stands now? Guess they were neglected and had to be removed. Whether that was by accident or intention we’ll never know. Can’t see what type of crime it is that only adults can prevent. Is that a sea monster sideshow next door? ’36 was happening!